Empowering children to explore their senses. 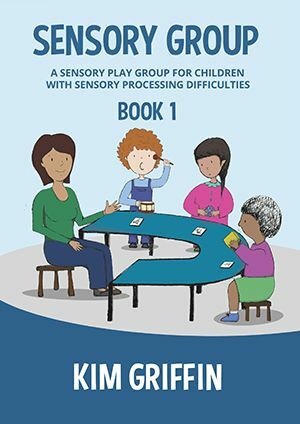 Purchase Sensory Group Book 1 Today! If you would like to purchase a copy of Sensory Group Book 1 please chose the best option for you below. The book is £18.99, and this includes free shipping to mainland UK. If you are living outside of the UK please choose the correct shipping option below. We are a small business so please allow up to 8 working days for delivery to mainland UK, 15 working days to Europe and 20 working days for the rest of the world. If you have already purchased a copy of Sensory Group Book 1 and want to access the additional online resources, please click here. Please note you will need the password on page 33 of the manual to access this part of the website. It is expected that anyone using these resources has read Sensory Group Book 1 and is following the recommendations and precautions outlined in the book. Who is Sensory Group Book 1 it suitable for? Sensory Group Book 1 is aimed at children aged three to five who avoid engaging in sensory-based play. This includes children who dislike having their hands dirty and also those who avoid textures such as sand, Play-Doh, glue and finger paint. It is suitable for children who just don’t notice or explore sensory-play opportunities in their environment. It can be used by children who are very intense with their sensory play to help to encourage turn taking and waiting. In addition, it would also be a good starting point for young children who are fussy about food textures, because often these children have some touch sensitivity underlying their fussy eating. The group is also suitable for older children who are at a three to five-year-old’s cognitive level due to developmental delay. It has worked well in Key Stage 1 classes (five to seven-year-olds) with children who have developmental and joint attention delays, especially with children with autism. It is also suitable for older classes in which children have more severe developmental delays. The group was initially designed for a specialist-school setting or assisted resource unit, but it could also be used in a mainstream school to support a child if additional children were available to participate. It could be used at home or in a therapy setting if a group of children was available. What is involved in running the sensory-play group? The group programme involves using 12 lists that contain different sensory-play items. It is designed to be completed like a joint attention group, with the adult in front of the group and the children seated facing the adult. The adult presents each item and the children are expected to sit at the table and wait their turn. After the leader of the group has presented the sensory item they encourage each child to engage with this item when it is their turn. The group leader uses visuals to support the transition between each sensory item and moves down the list in order. The format of the group stays the same across the lists and the warm-up and transitions activities remain the same in order to create a routine. The group aims to not only target participation with sensory items but also facilitate joint attention and turn taking. It is expected that the child’s attention and engagement will increase each week in the group. Each group session will last for 10 to 40 minutes, depending on the number of children included and their level of ability and attention. Who can run sensory group? The group programme is designed to be run by teaching staff, including teachers and teaching support staff. It is suitable for therapists and therapy assistants who wish to facilitate groups and would like a ready made programme. It could also be run by parents if there were siblings, cousins or friends available to be involved. It is expected that adults running the group are providing adequate supervision and that the group outline is adhered to at all times. There are extra safety precautions marked with safety flags, which must be followed to ensure safety. How frequently should we run Sensory Group? It is recommended that the group is run two or three times a week. It can be completed in a messy-play, joint-attention or turn-taking space within the class timetable. The group presents the ‘verbs’ and ‘nouns’ for each activity, so it could also be used to help support literacy for children who are very delayed in understanding these concepts. Why will children benefit from Sensory Group Book 1? The Sensory Group Book 1 programme is specifically written for children who need extra support to engage in sensory-based play. This includes children who avoid messy textures or noisy toys and children who just might not notice sensory-play opportunities. The programme targets children’s auditory, visual, touch and proprioceptive senses. It is progressive, with each list building on the previous one, to increase children’s engagement with sensory-play activities over time. The group aims to target not only sensory sensitivity and avoidance but also joint attention and turn taking. It is clearly structured and includes risk assessments and pre and post assessments so that you can measure the children’s progress over time.